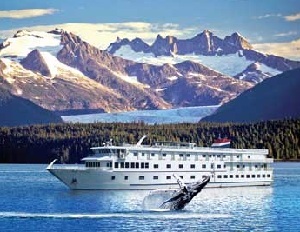 American Cruise Lines announced the conclusion and "great success" of its inaugural 2012 season in Alaska. The 100-passenger American Spirit – the newest small ship in Alaska –operated numerous weekly roundtrip cruises this summer from Juneau. Following guest reviews, the Alaska Inside Passage cruises will resume again in the summer of 2013 on June 1. In addition, beginning in the spring on April 13, the American Spirit will operate American Cruise Lines’ newest itinerary, Puget Sound & San Juan Islands, offering seven-night roundtrip cruises from Seattle. American Cruise Lines, the largest U.S. cruise line, operates the newest fleet of small luxury ships in the industry. Seven ships, each carrying no more than 150 passengers, offer more than 30 unique itineraries along the inland waterways and rivers of the Pacific Northwest, Alaska, the Mississippi River System and East Coast of the United States, from New England to Florida. The inaugural season in Alaska was extremely well received by guests who were the first to enjoy Alaska in the comfort, elegance and intimacy of the American Spirit. While onboard, they encountered towering glaciers at close range and spotted wildlife including humpback whales, brown bears and bald eagles. Guests also enjoyed the company and insight of an onboard Alaskan expert and naturalist, offering daily lecturers and presentations on Alaska’s history, culture and natural wonders. Guests were greeted by the port towns, with a special welcoming event held for the inaugural visit to Alaska’s famed Glacier Bay National Park and Preserve. A complimentary shore tour package and pre-cruise hotel stay will be offered again in 2013 on all Alaska Inside Passage cruises. Ports of call will include Glacier Bay, Icy Strait/Hoonah, Skagway, Petersburg and Tracy Arm. The American Spirit offers a full range of onboard amenities, including an elevator to all decks, numerous glass-enclosed lounges and oversized staterooms, the majority of which have private balconies which offer unobstructed views of the Alaskan scenery. The ship offers an intimate and refined onboard atmosphere perfect for guests who seek enriching travels and share their passion for exploration, adventure and discovery.